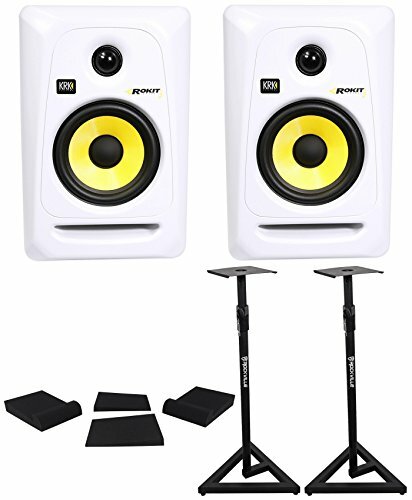 (2) KRK RP5G3W Rokit White 5'' Active Powered Studio Monitors+Stands+Foam Pads by KRK at Riot Recordings. MPN: (2) RP5G3W+RVSM1+RRS190S. Hurry! Limited time offer. Offer valid only while supplies last. KRK's ROKIT 5 G3 (Generation 3) powered studio monitors offer professional performance and accuracy for recording, mixing, mastering and playback. KRK's ROKIT 5 G3 (Generation 3) powered studio monitors offer professional performance and accuracy for recording, mixing, mastering and playback. The system consists of a 1" soft dome tweeter and 5" glass-Aramid composite woofer. It delivers high frequencies up to 35kHz, vocal clarity and extended bass response. The proprietary bi-amped, class A/B amplifier grants SPL up to 106dB. The ROKIT waveguide is designed to ensure detailed imaging in the listening position. The front-firing bass port reduces boundary coupling to allow flexible positioning in the room while the engineered surface reduces diffraction distortion. Multiple input connections ensure the ROKIT 5 G3 will easily integrate in any system configuration. KRK RP5G3W Rokit White 5" Active Powered Studio Monitor Speaker. Bi-amped, class A/B amplifier offering large headroom and low distortion. Proprietary waveguide optimized for superior imaging. 1" Soft-dome tweeter provides pristine clarity and extended response up to 35kHz. High-frequency adjustment tailors the system to personal taste. Lightweight, glass-Aramid composite woofer delivers clear midrange and tight bass. Low-frequency adjustment tailors the monitors to taste and adjusts for room acoustics. Front Firing Port - Low-frequency extension while reducing boundary coupling. Radiused edges reduce distortion from diffraction. Low-resonance enclosure for minimized distortion and colorization. Multiple audio input connectors (XLR, ¼", RCA) for universal connectivity in any studio environment. Factory installed foam pad provides isolation between the speaker and surface. Peak SPL: 106dB. Frequency Response: 45Hz - 35kHz (+/- 2 dB). Configuration: 2-Way. System type:Active Studio Monitor. Low-Frequency:5" Aramid Glass Composite woofer. High-Frequency:1" soft dome tweeter. Max Peak SPL: 106 dB. Amplifier Class: Class A-B. Power Output: 50W. High Frequency: 20W. Low Frequency: 30W. Input Impedance (Ohms): 10 K Ohm balanced. HF Level Adjust: -2dB, -1dB, 0, +1dB. System Volume: (-30dB - +6dB). Indicators: Power. Input Connectors: Unbalanced RCA', Balanced 1/4" TRS, Balanced XLR. Enclosure Construction:MDF. Finish: White vinyl wrap. Port Configuration: Front firing slot port. Dimensions: (D x W x H):9.06" (230mm) x 7.28" (185mm) x 11.10" (282mm). Weight: 14.1 lbs (6.4 kg). Studio Monitor Stands (Pair). Adjustable Height. Steel Construction. Nylon clutch for adjusting. EVA Pad on top to eliminate unwanted vibrations.